We believe in the school of thought that any venue can turn into a magical place, with a little creativity and inspiration. 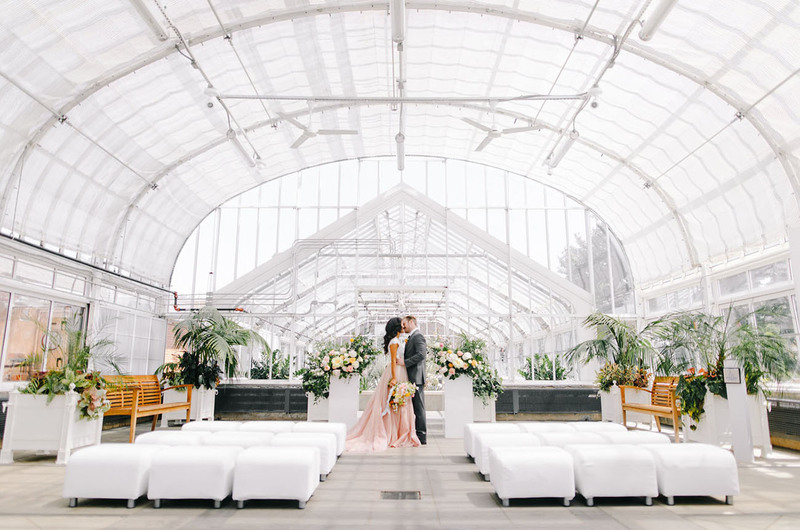 And today’s styled shoot at the Will Rogers Conservatory, located in Oklahoma City, designed by Aisle Be With You, is here to prove just that! 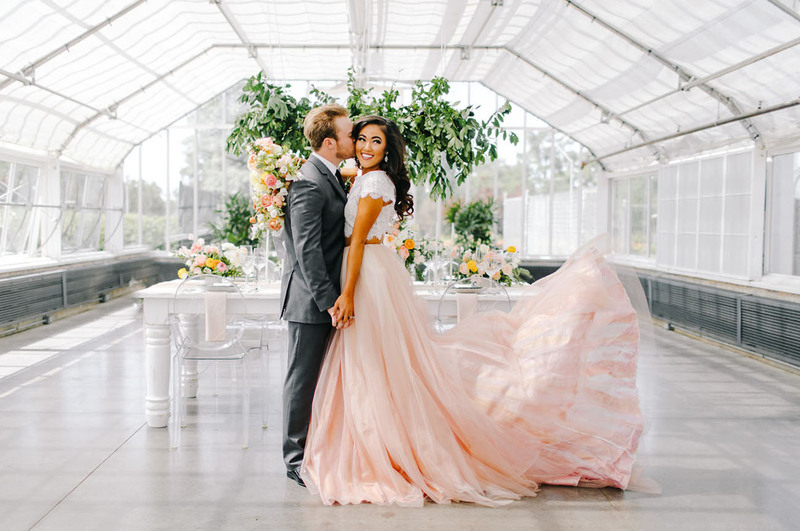 Vibrant colors, modern pieces, and whimsical elements all were brought together to create this peachy-toned editorial, and we’ve got to say — it’s quite the spectacle! 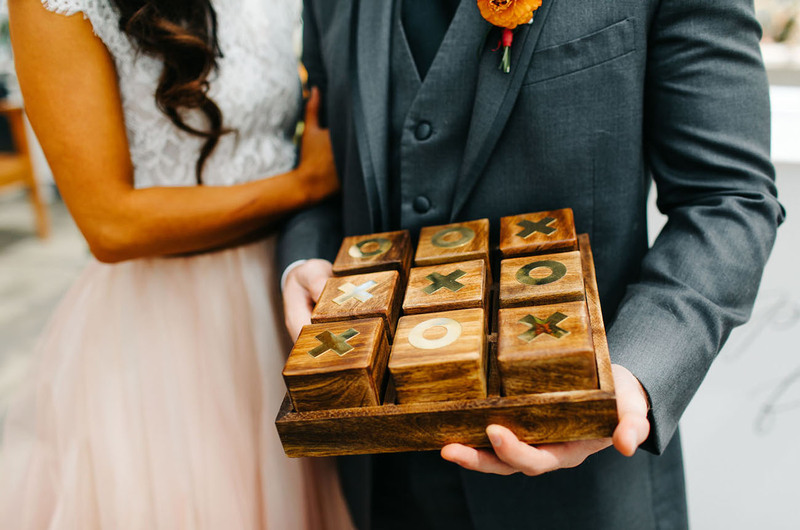 Sarah Libby Photography tells us Recent newlyweds, Alicia and Jeff, were the sweetest models for the day and brought that extra *spark* of magic that we sought. 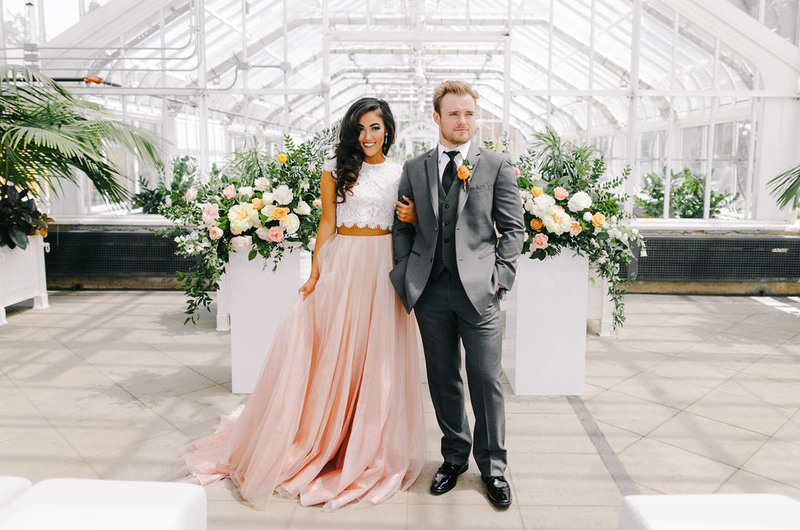 We wanted to create a clean, modern look, with lots of white and pops of peach/blush, greenery, and a touch of metallics (namely rose gold). 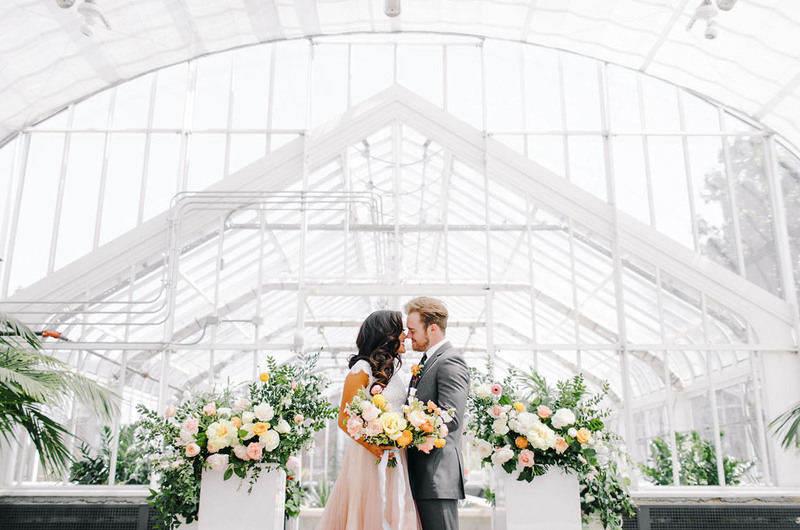 Ready to take a walk around the greenhouse? Let’s see how they transformed it into one beautiful venue! 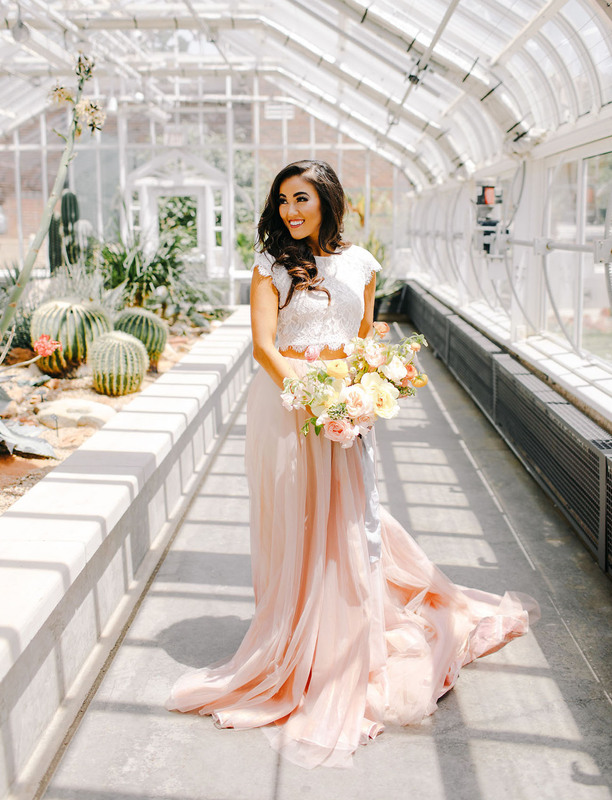 Oklahoma City’s hottest new bridal store, Chantilly Couture, provided the bride’s look. 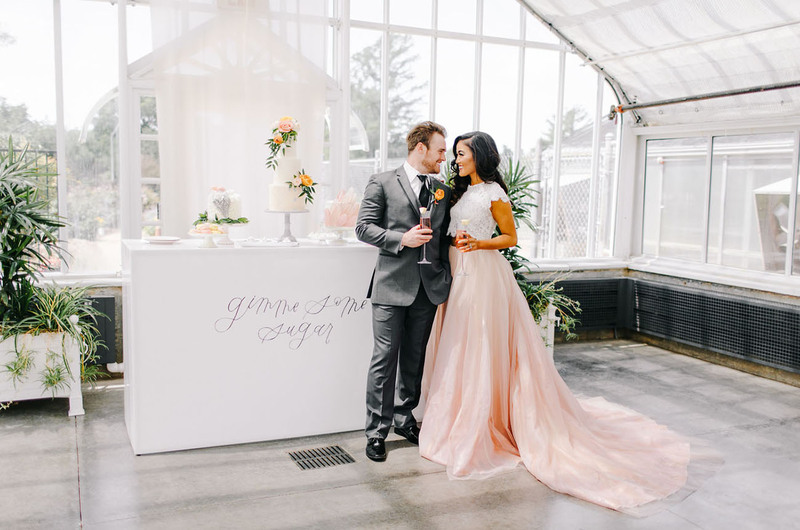 The hand painted rose gold skirt by Chantel Lauren and the ivory lace top by Tatyana Merenyuk were the perfect combo to set the vibe for a fun and flirty shoot. 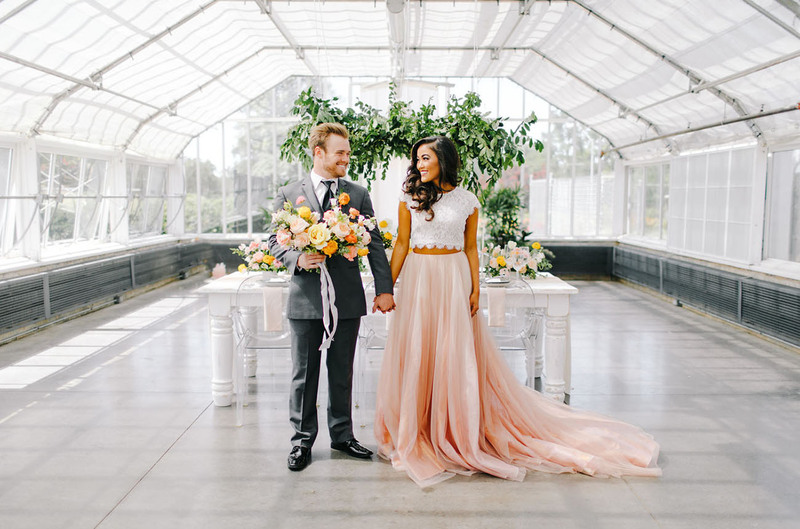 Sarah shares Overall, this shoot was designed to inspire brides to think outside the box. Any venue has the potential to really shine. 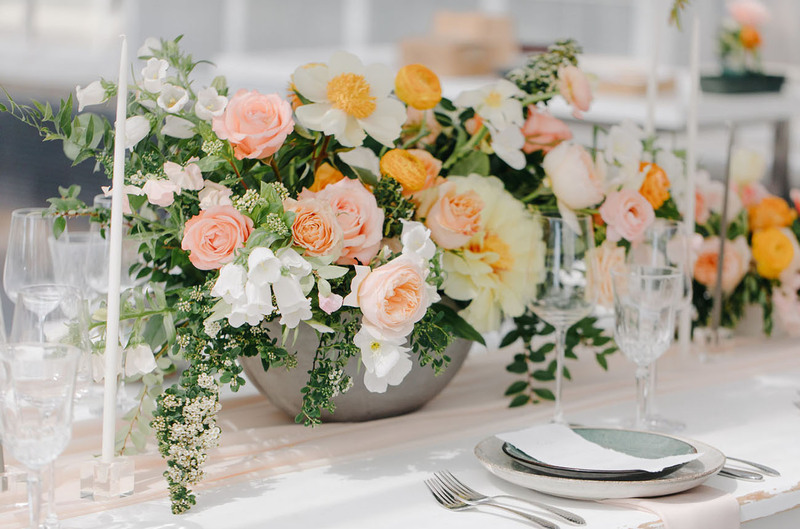 Also, incorporating colors that you don’t normally see at weddings and events can really make your wedding have an impression on your guest that will last a lifetime. We couldn’t agree more! Let’s not forget about the dapper groom! He wore a dark gray suit by Vera Wang that can be found at your local Men’s Wearhouse. We’re big fans of dark gray suits and think they can match with so many different color palettes! 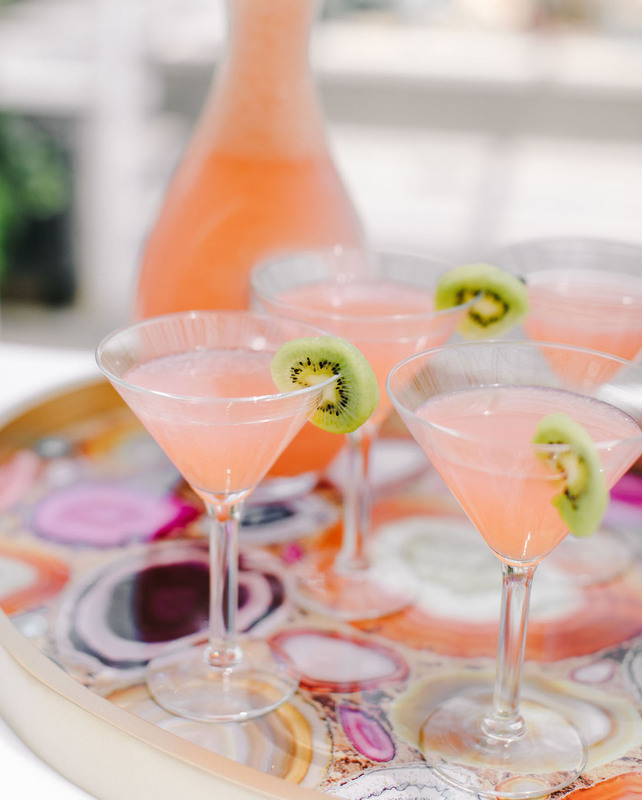 A gorgeous agate stone tray with pink lemonade martinis to quench your thirst? YUM!! 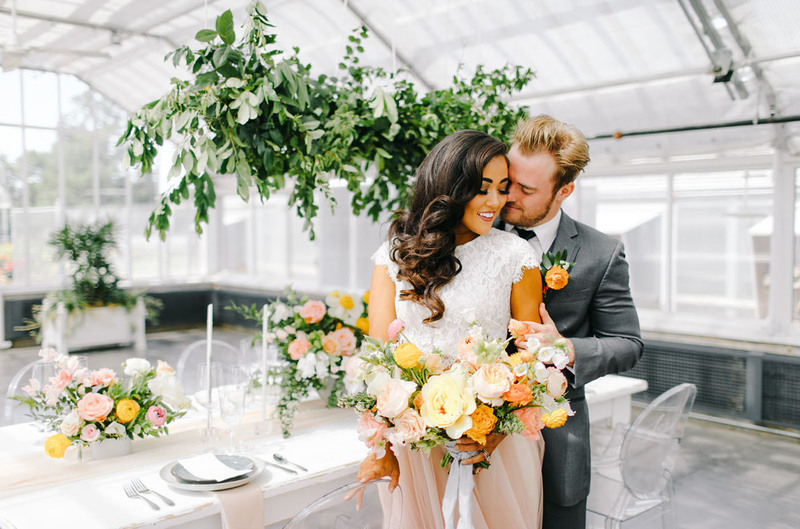 The ladies of Ever Something designed the most beautiful floral arrangements that set on top of the columns and throughout the shoot vignettes. 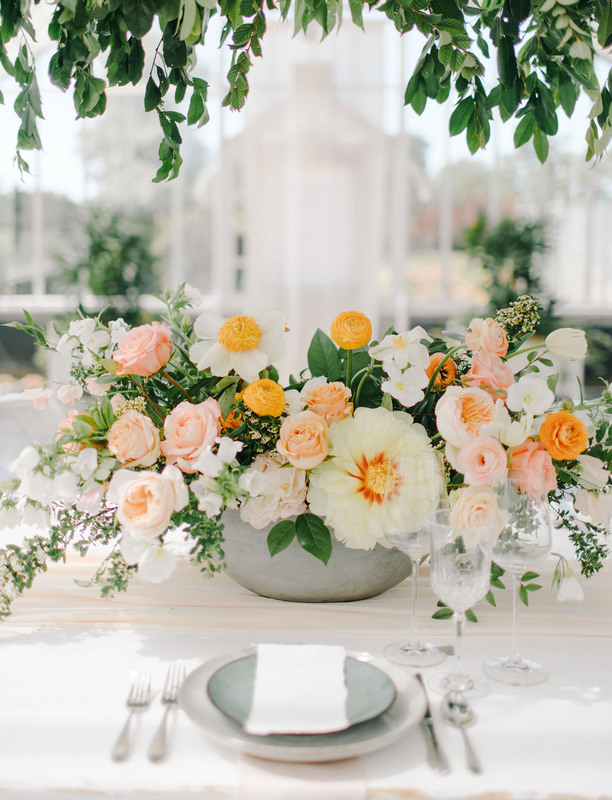 The floral consisted of the prettiest blooms in different shades of yellow, blush, orange, white, and greenery. 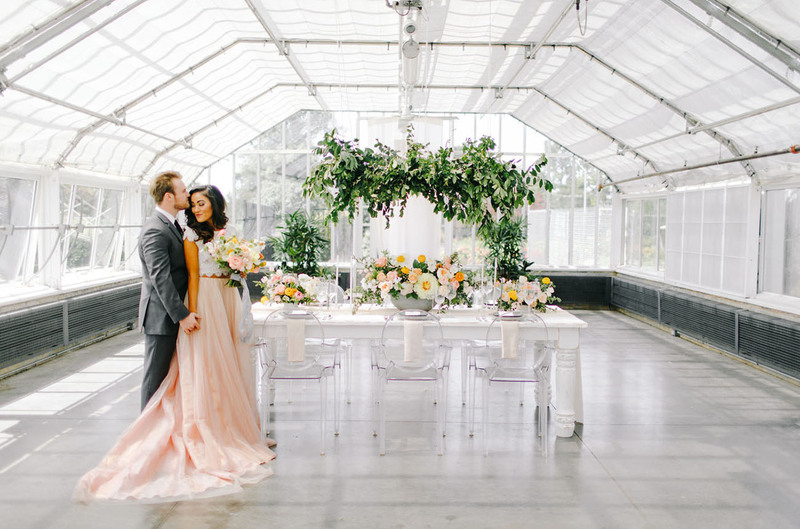 The garden style arrangements added to a soft and romantic backdrop. 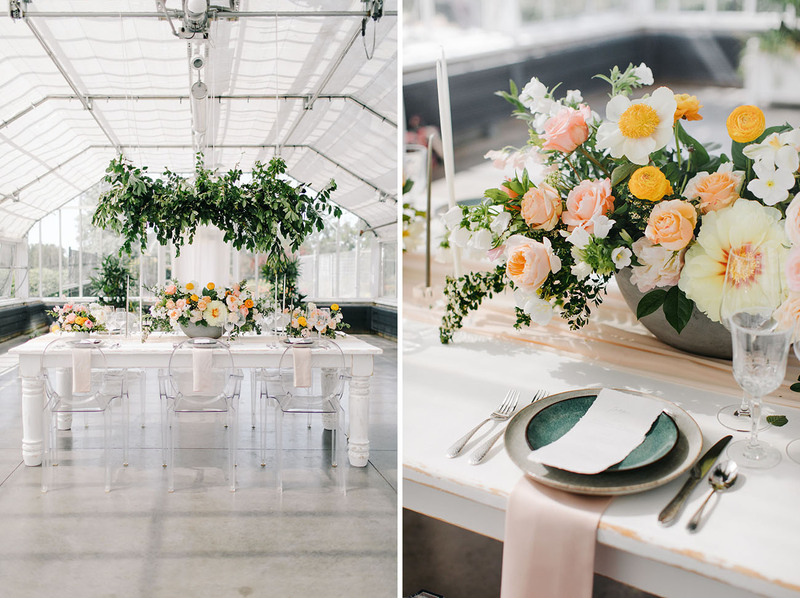 The white farm table, ghost chairs, blush satin napkins, and light peach chiffon runner were the perfect pairing for the tabletop design. Crystal wine glasses along with hammered flatware provided by Marianne’s Rentals completed the plate setting grouping. 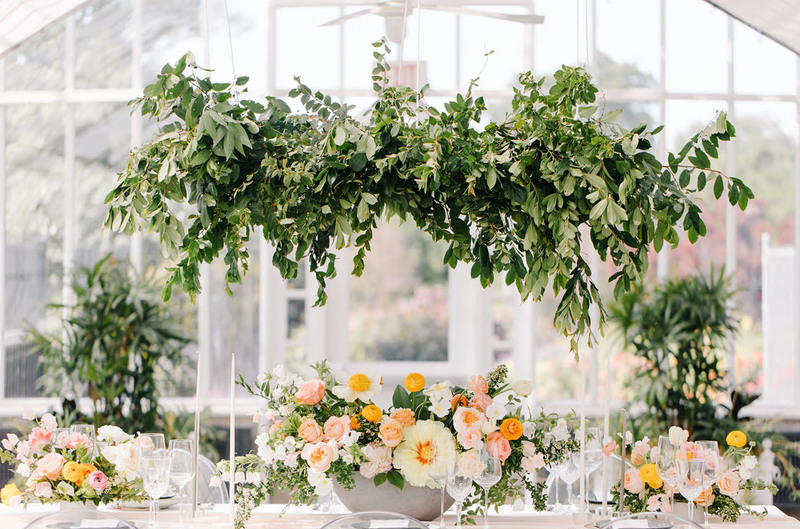 The breathtaking floral centerpieces in concrete compote vases, and the eye-catching greenery chandelier were the final touches in creating the show stopping tablescape. 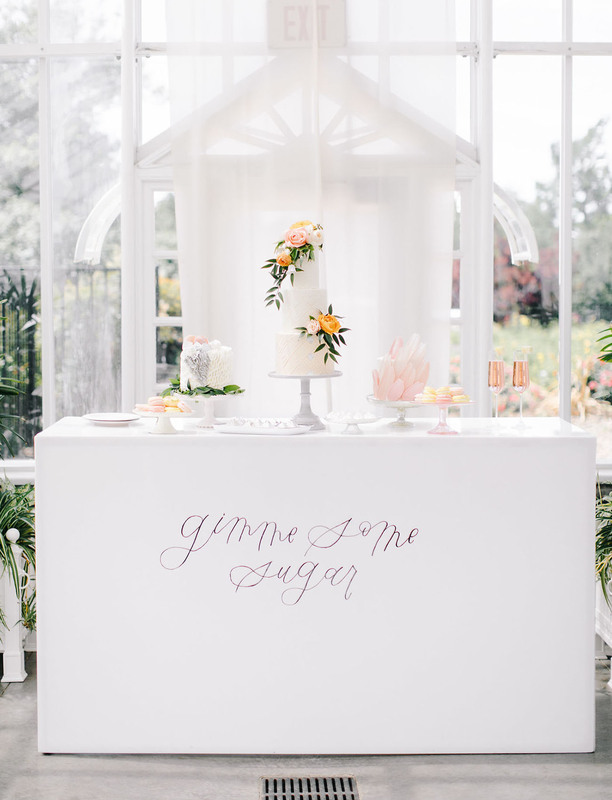 “Gimme some sugar” — easily one of the cutest dessert tables we’ve ever seen (mad props to Oh Honey Paper Co for the calligraphy)!! 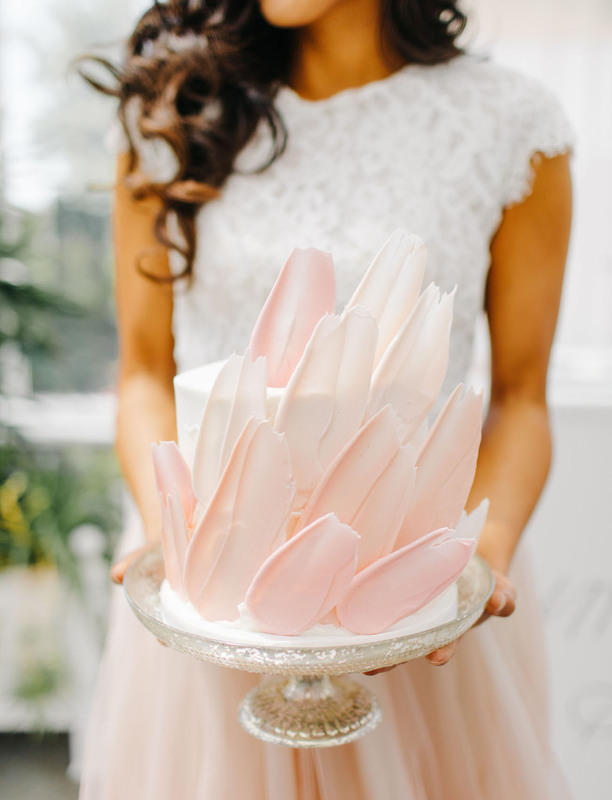 The white acrylic cake table from Mood Party Rentals served as a beautiful backdrop for all the decadent sweets made by Amy Cakes: hand painted macarons, white marble chocolate pyramids with silver flakes, the main wedding cake in light peach tones, and the two accent cakes. 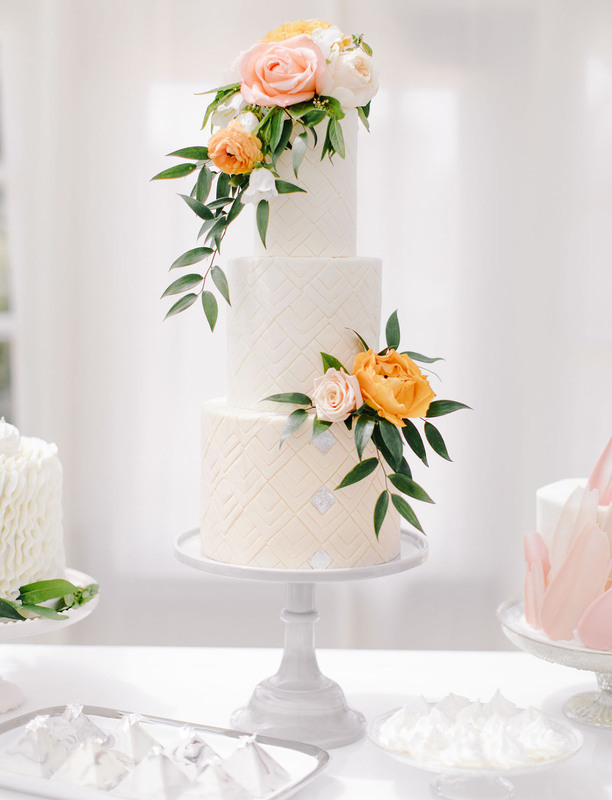 How cool is this peach + blush-toned cake?! Quite the confectionary masterpiece by Amy Cakes! Take a tour of the greenhouse + immerse yourself in all the inspiration in this clip by Ripperton Films. Stunning wedding dress! It is so different and very gorgeous. Truly an inspiration. I love the peachy theme! Wonderful dress!